The Oracle: Everything that has a beginning has an end. I see the end coming. I see the darkness spreading. I see death, and you are all that stands in his way. There was so much hype for the two follow-ups to The Matrix, the surprise blockbuster of 1999, that disappointment seemed, to borrow a phrase from the series' main antagonist Agent Smith, not impossible... inevitable. The first film was mind-blowing to the many who ate up its ironic humor, stylish violence, ground-breaking special effects, and the impressive pseudo-philosophical sci-fi conceit at its core�that the world we see is merely a construct, a computer program created by machine overlords to keep human beings docile while they harvest our bodies for energy. After The Matrix made a mint for Warner Bros., the studio asked brothers and co-directors Larry and Andy Wachowski for a pair of follow-ups, their own trilogy to rival George Lucas. The brothers agreed, but demanded complete control and a huge budget. They got it, and if nothing else, the sequels are proof that even the sharpest minds can suffer when working without constraints. With enough money to do whatever they wanted, the Wachowskis turned the already somewhat overblown series in on itself, ramping up the anime influences and the convoluted workings of the Matrix mythology. The results weren't popular with the fans of the first film�though it grossed $280 million, many strongly disliked The Matrix Reloaded, and the far less successful Revolutions is considered by most to be the worst of the lot. Plot summary is basically pointless after the heady Reloaded, which teetered on the edge of parody with its stilted acting and obtuse dialogue. The two sequels were filmed simultaneously, so the Wachowskis didn't have a chance to change the story to correct complaints about Reloaded. Thus, we pick up where we left off�Neo's (Keanu Reeves) body lays lifeless onboard a ship carrying the survivors of a mishap that destroyed most of the human fleet. His mind is trapped in some sort of transitional part of the computer world after he somehow used his special powers in the real world at the end of Reloaded. Agent Smith (Hugo Weaving) has replicated himself in the Matrix and beyond, into the body of a comatose human lying next to Neo in the sick bay. The machines are still digging down to Zion. And about 30 peripheral characters are fighting for screen time, among them Neo's main squeeze Trinity (Carrie-Anne Moss, looking utterly ridiculous in her plastic dress... nice gloves); his Yoda, Morpheus (a chubby Laurence Fishburn); and the Oracle (Mary Alice, taking up the role following the death of actress Gloria Foster). It's easy to see why audiences were so unhappy with the conclusion to the Matrix trilogy�it crowds Neo out of the picture in favor of a bunch of faceless, boring humans fighting the battle to save Zion. Neo's quest, and the love story between Neo and Trinity, provided the driving force for the first two films, but, though he's important to the story, Neo has little to do for much of Revolutions (at one point, he and Trinity work off-screen for nearly half an hour). The stories we do get�the epic battle as machines invade Zion, Morpheus and old flame Niobe (Jada Pinkett Smith) driving around (no, really)�aren't nearly as compelling as they should be. Yet the ideas are there, and so is the action. There are a number of great martial arts sequences, and the CGI during the machine invasion of Zion is sometimes breathtaking (the swarm of flying Sentinels bursting through the city's defenses elicited a gasp when I saw the film in the theater). Though the story moves in fits and starts, I like the way it wraps up, offering a conclusion but still leaving some things open to interpretation. The acting is stilted, particular from Moss and Reeves, but it's all part of the "world" of the Matrix (the dialogue and costumes are pretty ludicrous too, after all). The two do have a few very strong scenes together, including Trinity's first glimpse of the real sky. I think there were better ways to film the ending of The Matrix, but at least in terms of tone, Revolutions gets it right. The Wachowski brothers have created a sci-fi epic that will probably outlive its frosty reception at the box-office, one that favors big ideas over brainless plotting without sacrificing the spectacle we've come to expect from big-budget sci-fi epics. Image Transfer Review: Each release in this series has been hailed as a benchmark in image quality (though the transfer of the first film is a bit dated these days). I certainly see no problems with the sequel, which is top notch all the way. The color palette is very dark and grim, but the image is always rock-solid and free of grain. Blacks are strong and shadow detail is excellent. I never noticed one instance of digital artifacting or aliasing, even in the busiest action scenes. The image is crisp and lifelike throughout, and shows no evidence of edge enhancement. Even the special effects look better than they did in the theater (thanks, undoubtedly, to the smaller screen and lower resolution). Audio Transfer Review: I suppose some will bemoan the absence of a DTS mix, but I can't imagine a track sounding much better than this DD 5.1 one. Every channel is put to good use, with the center and front mains delivering crisp dialogue and a wide stage for most of the action and music. There is great right-to-left panning and stereo separation and seamless panning from the rears to the front mains. The surrounds are active throughout, contributing subtly at times, blaring during epic battle scenes. And LFE is ground shaking throughout. I listen at far below reference levels, and still my cat seems unsettled by the rumbling of the machine attack on Zion. 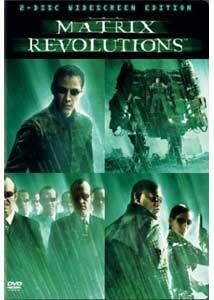 Extras Review: The Matrix Revolutions includes extras very similar to those included on Reloaded. There is obviously a lot that isn't here�including the ancillary footage filmed for the Enter the Matrix videogame that fills in some gaps in Niobe's storyline�but I'm sure those bonuses will follow in some ultimate boxed set down the line. For now, this package offers a nice array of material that is informative, if not particularly new or innovative. Though most of the extras are on Disc Two, there are a few welcome inclusions on the first platter: The teaser trailers for The Matrix, Reloaded, and The Animatrix, and the theatrical trailer for Revolutions. This is the first time a DVD in the series has included any trailers at all, and though I'd prefer to have the full trailers along with the teasers, I'm glad to have some of them, anyway (note the full trailers for the first two films were included on an exclusive Best Buy bonus disc when Reloaded came to DVD; they are still available on eBay for completists). Disc Two includes a number of featurettes typical of the "making-ofs" on other series releases. Revolutions Recalibrated (27:00) is an overall summation of the making of the film from the actors and behind-the-scenes crew (though the directing duo is as camera shy as ever). Different members of the production team discuss the action and stunts in reverential tones, revealing a few behind-the-scenes secrets along the way. Fairly typical, but at least this piece is generally free of promotional fluff. This featurette includes a "follow the white rabbit" link to another piece, Neo Realism (12;22) that covers the evolution of "Bullet Time" from The Matrix to Revolutions. CG Revolution (15:23) is pretty self-explanatory�a how-they-did-it covering the film's special effects. I'll give you a hint: computers. That's all I'm saying. Follow the white rabbit to Super Big Mini Models (8:47), which focuses on the miniature work used in the Zion scenes. Super Burly Brawl is another SFX piece, a six-minute four-way split screen showing four stages of the production of the final battle between Smith and Neo. This piece includes another branching featurette, the seven-minute Double Agent Smith, which covers the work involved in creating dozens of doubles for the villainous agent during the final battle scene (the trickery required a combination of CGI, articulated dummies, and masks). There's another rabbit to follow here, to the eight-minute Mind Over Matter, a rather tedious piece on the stunt and wirework. Finally, Future Gamer: The Matrix Online tries to convince those unsatisfied with the ending of the Matrix saga to pick things up with the coming-soon-to-an-internet-near-you Matrix Online game. Nice ad, WB, but it isn't extra content. There is also a clunky, not very user friendly interactive Matrix timeline and the 3-D Evolution photo gallery, which requires lots and lots of button pressing, more than I'm willing to commit to. If you like photos, though, there are snapshots taken during all stages of production. If you missed the white rabbit, you can access all four branching featurettes through the selection Operator. An uneven conclusion to the saga of the Matrix, Revolutions was one of the most hated films of the 2003, capping off the perceived failure of Reloaded with what many consider to be one of the most convoluted, pointless sequels since George Lucas decided he needed some extra cash. And yet, I like it. There's no question that The Matrix is the best of the three, but the sequels, including Revolutions, don't harm the original, and actually add new layers to what was always more effective as a grand notion of science fiction than an actual film.